New Orleans is often hailed as the festival capital of the world, ringing in different celebrations every day of the year. The same is true for National Hot Dog Month, a festivity locals and tourists can relish at Dat Dog in New Orleans. With locations on Magazine Street, Freret Street and Frenchman Street, Dat Dog brings a uniquely New Orleans element to the traditional hot dog stand. Walking into any of their locations can’t help but put a smile on your face — perhaps because the restaurants are covered with signs that say “Put a Smile on Your Face,” Dat Dog’s motto. The bright primary-colored décor, patio umbrellas and twinkling lights set the mood for an enjoyable afternoon of dogs, brews and smiles. But what makes a sausage at Dat Dog different from your average wiener? Perhaps it’s the perfectly toasted, crispy sweet Hawaiian bun providing ample support for both your dog and your surplus of toppings. Or it could be the plethora of sausages to pick from, each made with the highest quality ingredients. At Dat Dog, you can order sausages from around the world including a Bratwurst, a Guinness Dog (they advertise it’s made in heaven), and a Slovenian sausage. 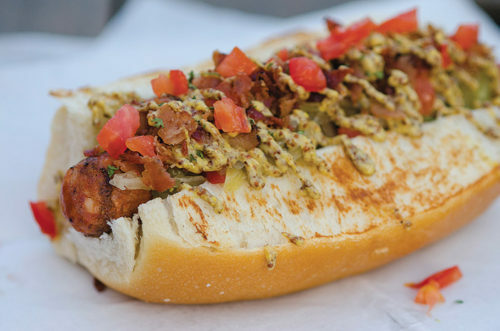 You can also order a dog with some homegrown NOLA flair like the crawfish sausage, alligator sausage and Louisiana hot link– and that’s just naming a few! Add your choice of more than 20 toppings including classics like sauerkraut, and Dat Dog originals like creole mustard, Andouille sauce, crawfish étouffée, guacamole, bacon, and Asian slaw. If you can’t make up your mind, Dat Dog has a menu of specialty dogs paired with the perfect toppings to make your taste buds sing. Try the bacon Werewolf dog, a Slovenian sausage topped with bacon, sauerkraut, and spicy mustard. Or try the Duck Sausage Special with grilled onions, mustard and blackberry sauce. There are delicious combinations to suit everyone’s taste. Even though hot dogs are the star of the show at Dat Dog, their fantastic, crispy French fries are a must eat. Try the bacon cheddar ranch fries, or enjoy local flavors likecrawfish étouffée fries complete with fresh tomatoes and sour cream. Dat Dog also offers classic NOLA brews on tap along with other ales. The full bar serves bloody Marys and rum punches along with classic non-alcoholic root beer and ginger ale. Sit on the patio at the Magazine and Freret Street locations or enjoy your dog from the lively balcony on Frenchman Street listening to live brass bands perform. Whatever location you visit, you will leave with satisfied taste buds and a smile on your face.